Boston resident Bridie left Co Galway in 1929 and still returns every second year. The Galway Tribal Diaspora Project aims to connect exiles scattered across the world with their home place by letting them tell their stories in their own words. Last week I spoke to Michael Quinn, who runs the project, for Irish Central and I wrote profiles of five of the participants. Within days, an amazing lady who lives in Boston had added her story to the online exhibition. On Tuesday, Bridie Daly (nee Duggan) agreed to share her story of fun, heartbreak, and joy after being cajoled into it by her daughter in the United States and her niece back home in Co Galway. Such is her popularity in her home village of Woodford, Co Galway, that her name popped up immediately when second level students were asked to nominate prominent emigrants from the area for the online exhibition. “I believe myself to be a happy and contented person. I am still very active and independent – I regularly attend Mass, I go to Irish events and I get my hair done every week. I also enjoy a small drop of whiskey now and again!” she says with a hearty laugh. 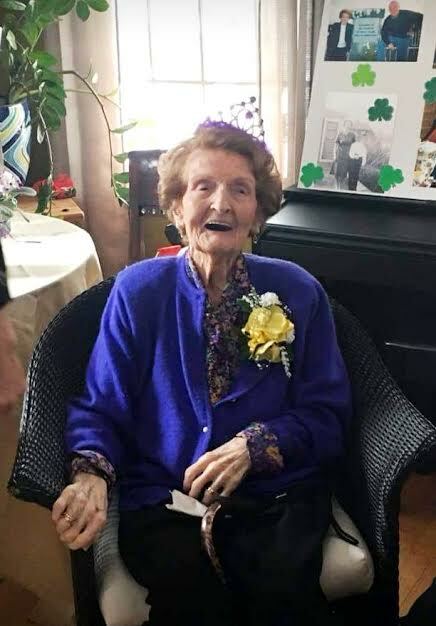 I have written a feature on Bridie for IrishCentral.com, the US-based website, which went online this morning..
Michael told me that Bridie is hoping to fly home for her 108th birthday next February and that she maintains strong connections with Co Galway, even though she left for the US in 1929. She has outlived three sons, including one who served with the US military in Vietnam. “All stories of emigration are interesting. We didn’t want to focus on people who are particularly old or successful, but about the breadth of experience which people have had across the globe. Of course some stories are going to jump out at you more than others,” said Michael.